The trees are shedding their leaves, the birds are flying south, and the winter coats are coming out of storage. It’s time for your restaurant to make its own preparations for winter by updating your menu. Changing your menu seasonally is a great way to create new marketing opportunities for your restaurant, lower your food costs low by avoiding what’s out-of-season, and keep your employees and customers engaged, excited, and talking about your food. For instance, you can hold a daily countdown on your social media page to the big unveiling of your new menu. Once it’s unveiled, feature a new dish every week to get people excited. According to Google, uncured bacon is a “sustained riser” in trending foods for 2016, which may sound as obvious as the sky is blue. Bacon is never going out of season, but cold weather has people craving comfort foods that are high in fat. Some scientists believe it’s our animal instinct to try and make it through the winter without freezing. Add some bacon dishes to your menu, like seared scallops with bacon, and your customers will be braving even the worst winter storms to taste your food. Cauliflower was the new ‘it’ vegetable of 2015, taking over kale’s reign, and it remains at the top of the charts as far as in-demand food is concerned. Not only that, but cauliflower comes into season in late fall and remains fresh throughout the winter, with 77% of the recommended daily value of vitamin C. Make sure your customers get the vitamin C they need to keep their winter colds at bay by warming them up with a delicious cauliflower dish, like a mouth-watering cauliflower gratin. Cinnamon and nutmeg are spices that can make anyone reminiscent of winters past, but they likely got that reputation because of their practical use. 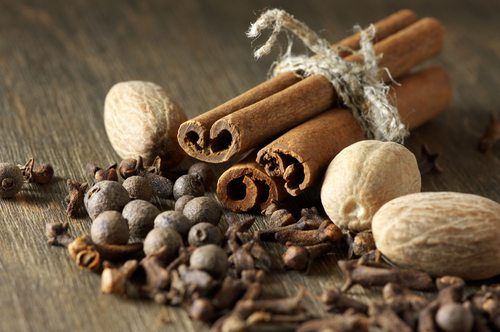 Unlike spices that make you sweat, both cinnamon and nutmeg have the ability to boost your metabolism, allowing you to warm up more quickly. Invite your customers inside to get warm with a mug of hot cocoa with a dash of cinnamon and they’ll be sure to come again. Much like cinnamon and nutmeg, ginger has the ability to keep your body warm. It also has some amazing health benefits and is a great way to give your immune system the boost it needs. It’s incredible versatility makes the perfect addition to any soup, entree, or even cocktail—a maple-ginger hot toddy will certainly draw people in your door. We all know butternut squash and pumpkin, but there are many other winter squashes that can add some delicious, nutritious seasonal comfort to your menu this winter—like acorn, delicata, delicata, spaghetti, and hubbard. Winter squashes are high in the starch that we crave in winter to take away our winter blues, but they’re also a great source of antioxidants, carotenoids, and vitamins. Roasted or mashed, add some winter squashes to your menu and watch your dishes fly off the menu. Update your menu this winter with these ingredients and you’ll have new and old customers in your doors, talking, and coming back for more. SinglePlatform helps you attract more diners by putting these new and improved menus across the web where customers are searching. Learn more today!